It will be a senior-only, IFSC Boulder World Cup style event spread over Saturday and Sunday. Back in Sheffield this year, but in a whole new location, the BMC British Bouldering Championships has moved right into the heart of the city at Devonshire Green, coming to you on 9-10 July. 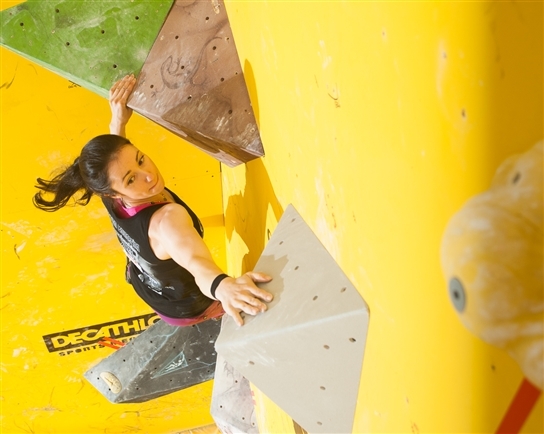 The British Bouldering Championships (BBC) is organised by the BMC and is the national championships in the UK. Since its inception in 1998, it has grown to be a very popular event. It now also forms part of the selection process for the Senior British Bouldering Team. The Senior Bouldering Team is supported by the Arch Climbing Wall and Berghaus. Set to take place on Devonshire Green, the BBCs is free to watch and will be extended into the evening to take advantage of the warm weather. There will be live music on both Friday and Saturday night and the competition wall will be surrounded by food and drink stalls, a special BMC member VIP area and lots of other attractions – it’s going to be a fantastic weekend of competition and entertainment. This year’s event is an IFSC Boulder World Cup style event, with qualifiers on Saturday (9 July) and Semi-Finals and Finals on Sunday (10 July). This is a senior category only event and entrants must be born in 2000 or before. Seniors must be born in 2000 or before. Please note, on the day entries are available, but with a maximum number of 60 competitors in the male category, it is likely that the male category will be full well in advance of the deadline for entries; so enter early. Qualification round with five boulders for each category – 5mins on, 5mins off. Semi-Final round with four boulders for each category – 5mins on, 5mins off. Final round with four boulders for each category – 4mins+. Qualification and Semi-Final rounds will be climbed onsight, and there will be an observation period for the Final round with isolation used throughout. Approximate grades of problems: Senior female V3-V8/V5-V8, Senior male V4-V9/V7-V10. The starting order for qualification will be derived from the 2015 BBC rankings and then at random (if you did not compete last year) and will be posted online on Friday evening. Males will compete in one group this year. This timetable is subject to change at any time. The Semi’s and Finals on Sunday will be live streamed – you can watch live by clicking the links below. • All competitors must be a BMC, MCofS or MCI member. • Parental consent must be given for any competitor aged under 18 years on the day of the event – the parental consent form can be downloaded in the entry process. • All applicants will receive an email confirming receipt of their application. They will then receive a further email containing full event information two days before the event. Male and Female startlists will be posted the day before the event. Please note that emails do not always reach their destination, it is therefore your responsibility to contact the BMC if email confirmation has not been received by Friday 8 July. The BBC problems are set with Entre-Prises climbing holds. Entre-Prises are the official supplier of bolt-on holds to the BMC. The British Climbing Team is supported by the BMC, Berghaus and the Arch Climbing Wall. Many UK walls also support the British Climbing Team through free or subsidised entry.